Some on the left downplay Kaine’s work for racial justice, an issue that’s crucial to the Obama coalition. Solomon and others are threatening to nominate an alternative to Kaine from the convention floor, a move Sanders opposes. But Sanders may not be able to stop it. During an emotional speech, in which he ran down his campaign’s many victories, the crowd booed when he asked them to support Clinton and Kaine. He did his best to cajole. “This is the real world,” he told them—meaning real-world politics requires compromise. But some of his supporters aren’t listening. For the record, I wasn’t pulling for Kaine; I preferred Senator Sherrod Brown (though I knew he was a long shot, since Ohio Governor John Kasich would get to pick his successor) or Labor Secretary Tom Perez, a strong progressive on labor and civil rights and an impressive Clinton surrogate. But the more I’ve seen of Kaine, and learned about his record, the more I’ve come to believe he was a smart choice for Clinton–and that progressives who loudly oppose him, to the point of obstruction, are missing the point of small-d democratic politics. He shouldn’t be derided as a “Blue Dog Democrat,” the spine-free centrists who’ve been a brake on the party’s necessary shift left. He’s much more courageous than that. Ari Berman writes more thoughtfully than I could about Kaine’s impressive history of civil-rights litigation and political courage in Richmond, Virginia–a city so opposed to African-American political power that it annexed a nearby suburb to dilute black voting strength. It couldn’t work forever; Richmond became majority black, and that’s where Kaine began his law career, working on civil-rights, housing-discrimination, and death-penalty cases. On the city council, his majority-black colleagues elected him Richmond mayor in 1998. Kaine has also taken courageous stands on gun control and women’s rights. In Virginia, the home of the National Rifle Association, he’s earned an F from the pro-gun powerhouse. 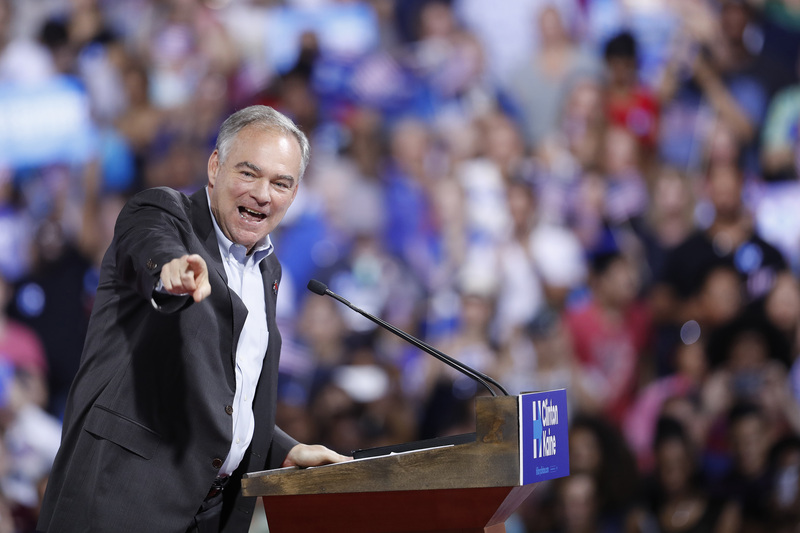 The governor at the time of the horrific Virginia Tech massacre in 2007, Kaine used executive action and worked with the legislature to close gun loopholes, and he remains a strong voice on the issue. And though he began his career supporting restrictions on abortion rights, as a pro-choice Catholic he has “evolved,” as we say, winning a 100 percent from Planned Parenthood and NARAL Pro-Choice America for his Senate record. It’s true that on business issues Kaine has been a centrist, supporting trade deals and Virginia’s “right to work” law. (Though he has a 96 percent grade from the AFL-CIO, and this weekend he came out against the TPP, something of a flip for him). But that’s at least partly the complications of Southern politics: If you write off the votes of racists, social conservatives, and Second Amendment absolutists by embracing progressive stands on race, women’s rights, and gun control, you’re going to have to compromise somewhere, and Kaine has when it comes to business. He recently signed a letter asking the Consumer Financial Protection Bureau to ease regulations on credit unions and community and regional banks—which would include some giants like Capital One, a major Virginia employer—a move decried by progressives. The rift between the values of two key factions in the Democratic base—largely white progressives, who prioritize issues of corporate power and Wall Street corruption, versus many African Americans (and other racial-justice advocates), who believe ending racial discrimination is paramount—is widening again, in the debate over Kaine. This clash reprises some old battles between Clinton and Sanders—only this time, Sanders has kind words for Kaine, though he acknowledges he would have preferred a staunch progressive like Senator Elizabeth Warren. Still, Southern African-American delegates see Kaine as a fighter, and they applaud what he adds to the ticket. Kaine’s critics aren’t only Sanders supporters: His mixed record on abortion has even some Clinton backers concerned that she’s nodding to the center on this crucial issue. Kaine continues to say that, as a Catholic, he is personally opposed to abortion, but he believes it’s a woman’s right to make the choice herself. For women’s groups who are working hard to erase the stigma of abortion, like Lady Parts Justice, this feels like a setback. Yet Planned Parenthood and NARAL Pro-Choice America give Kaine a 100 percent grade for his Senate record and say he’s a reliable advocate on the issue. “The last four years in Congress have been brutal on on the issues of access to abortion, reproductive-health services and to Planned Parenthood. Tim Kaine has been resolute and strong,” says Planned Parenthood Action Fund’s executive vice president Dawn Leguens. I’m torn on this one; as a pro-choice Catholic myself, I think we need to make room for people with personal, religious reservations who are nonetheless strong on keeping the government out of a woman’s right to choose. And as an Irish Catholic, I am moved by Kaine’s devotion to Catholic social teaching, a huge influence on the American left from Dorothy Day through Michael Harrington. I have many relatives who went in a very different direction. Also: On this and so many fronts, I’m worried that some of my progressive allies are overstating how much we have pushed the country to the left. We have made an enormous shift, and Sanders is hugely responsible for proving it—but we are deluded if we dismiss the need to win at least some center-left Democrats, and some white working-class men, to win the presidency (and especially the Senate and House). I think Kaine can help do both. The Sanders insurgency has indeed pulled the party left, with dramatic impact: The party’s platform, with its stands on a $15 minimum wage, a financial-transaction tax, the death penalty, the reinstatement of Glass-Steagall banking regulations, tuition-free public college, and a commitment to a new health-insurance “public option,” including Medicare for a younger cohort of Americans, is drastically more progressive than it would have been. Just yesterday, in the convention’s rules committee, the Sanders forces pulled off another win: cutting the number of “superdelegates” by two-thirds. “This is a tremendous victory for Senator Sanders’s fight to democratize the Democratic Party and reform the Democratic nominating process,” Sanders campaign manager Jeff Weaver said in a statement. “We were pleased to work with the Clinton campaign to enact this historic commission.” Later, on MSNBC, he praised Clinton’s “gracious leadership” and said that, as a Virginian, he’d voted for Kaine many times. These remarkable Sanders-Clinton compromises have been obscured by the leak of DNC e-mails showing chair Debbie Wasserman Schultz and her team often sided with Clinton in Clinton-Sanders battles over media and the primary process. Even though Wasserman Schultz has resigned—another Bernie win—many of his supporters read the e-mails as evidence that the process was “rigged” against their candidate. That’s a claim that Sanders himself does not endorse, but the “Bernie or Bust” crowd buys it—and they’re hoping to make Kaine collateral damage. They can’t prevent Kaine’s nomination, but they can cast a shadow on it, and obscure how progressive Kaine is, especially for a politician from a recently bright red state—a politician who has played a role in turning his state purple, and hopefully, over time, reliably blue. Tim Kaine deserves better than this.